The Doctor and Mel win a place on a Fabulous Fifties intergalactic coach tour to Disneyland, Florida, Earth. When they’re knocked off course by a wayward satellite, however, the coach party arrives instead at Shangri-La, a remote Welsh holiday camp. The peace and quiet of the countryside are soon shattered by the arrival of an army of Bannermen soldiers, led by the ruthless Gavrok. They are tracking down Delta, the Chimeron Queen, with only one thought in mind: her destruction. The Doctor and Mel unite with aliens and locals alike in a frantic bid to save Delta, her Chimeron child, and the entire Chimeron race from extinction. Can they possibly succeed…? This is an unabridged reading of Malcolm Kohll’s novelisation of his own 1987 television serial, first published by Target Books in 1989. The author adds quite a lot to what we saw on screen during the original three-part adventure. 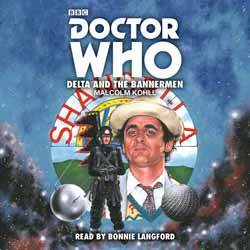 Scripts had a tendency to overrun during the Sylvester McCoy era, especially the three-parters, and Delta and the Bannermen was no exception. Kohll reinstates several deleted scenes, such as an opening sequence in the TARDIS (which can be seen in an extended version of Episode One on the DVD release of this serial). He also gets into the minds the characters – as well he might, since he created most of them. For example, on screen Billy seems quite confident in his wooing of the beautiful Delta, perhaps even a bit of a womaniser, but in the book we learn that he is actually quite nervous and uncertain. We are made aware of Keillor’s profession and what he is thinking about as soon as he realises that the Chimeron Queen is among the coach party – though arguably this robs the narrative of some of its mystery. We are also given the impression that the Doctor and Mel are already aware of who the Bannermen are – and perhaps by more than reputation, since Mel recognises them on sight. The prose makes it very clear that the Doctor and Mel have experienced many more adventures than the few we saw on television. The author’s opening description of the Seventh Doctor is rather peculiar: “Of all his multifarious incarnations, this was one of the nicest.” Really? Well, I suppose you could say that about the light-hearted Season 24 Doctor, before he became the arch manipulator of Seasons 25 and 26. When Kohll goes on to say that the Time Lord “had acquired enough thoughtfulness to ensure that he was always taken seriously,” this sounds more like the later Seventh Doctor, which is something of a contraction. The Doctor finds it difficult to get taken seriously (principally by the holiday camp leader Burton) in this very story. The screen version of this yarn had some fairly impressive effects for the time, such as the blobby, suckered Navarino form of Murray passing through a transformation arch, and lots of explosions during the opening battle sequence on the Chimeron planet. However, Kohll builds upon this to create in the mind’s eye alien vistas that were beyond the production team’s budget. The Tollmaster (played on screen by Ken Dodd) is described as a scaly lizard, the Bannermen have red eyes, the Navarinos are hairy artichokes, and Keillor is petrified like a stone gargoyle prior to his disintegration. As a result of all the extra material and descriptions, this novelisation is longer than many of the books based upon serials of four episodes or more, running to just over four hours on audio. Some of the descriptive text is a bit long-winded, though, and perhaps slows the plot down at times when we need to be getting on with the story. An example of this is when Kohll describes Murray attempting to accelerate the growth of the Quarb crystal using mental power, and then has Murray telling Mel exactly the same thing in dialogue. Mel herself, Bonnie Langford, reads this audio book, and anyone who’s heard her reading of Paradise Towers will know that we’re in for a treat. She gives all the characters distinguishable voices. Gavrok, for instance, has a guttural growl. The Tollmaster sounds not unlike Ken Dodd. The tollport PA system has a nasal, officious tone, rather like the Chief Caretaker in Paradise Towers. Not all of the Welsh characters (such as Ray and Goronwy) have Welsh accents, which is odd, though this factor was also inconsistent on screen, with Billy not sounding Welsh at all, despite having supposedly lived in the area since childhood. Burton has a very pronounced accent, just as he did when played by Richard Davies. As usual with talking books, the Seventh Doctor has a stronger Scots burr than McCoy ever did in the television show, but Langford succeeds in capturing his excitable nature and insatiable scientific curiosity. If you disliked the runaround romp that was the transmitted version of Delta and the Bannermen, then the novelisation is unlikely to win you over. However, if (like me) you found it exciting and fun, then this audio book expands upon it very nicely, providing happy holiday listening.